Alcam Signs and Lighting is located in South East Grand Rapids and has been serving the West Michigan, area for years, providing our clients with new signs, sign and site lighting maintenance and sign installations. 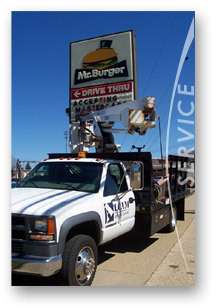 Alcam is fully insured and a licensed sign contractor in the State of Michigan. We have a strong commitment to prompt customer service and do our best to provide the information you need in making a good advertising decision. Alcam Signs and Lighting continues to keep a very basic principal as our top priority. Serving our customers always comes first and looking out for their best interest is the most important thing we can do. Be assured that we will always respond to what you need. We also welcome other sign companies to contact us with any service requests, installations or site surveys. Our Team will assist your company in accomplishing your goal.